How Did Technology Help Create China’s Historically Large Population? Chinese iron workers smelting iron ore to make pig iron and wrought iron. The left half shows the puddling process; the right half shows men operating a blast furnace. From the Tiangong Kaiwu encyclopedia, 1637, by Song Yingxing. Chinese technology was 1,000-plus years ahead of everyone else—like this, but with horses and rice. Imagine if today’s crops suddenly became 30 times more productive. That would cause a population boom, right? Agriculture is how human populations exploded in size compared to hunter-gatherer civilizations. So let’s talk about some of those tools of agriculture and how population booms were achieved in an era of horse and plow. Seed drill: What if we planted the seeds under the soil? Seed drills are tools that bury seeds at a correct depth in a timely manner. Planting seeds at a good depth increases the chances of an individual seed sprouting without being eaten by birds. The use of seed drills also allows for planting in nice orderly rows with good spacing, so the sprouting plants have enough room to draw nutrients from the soil without mutually starving one another. Not every grain will germinate, but using seed drills to plant crops in rows increases the chances of any individual grain germinating. This allows you to eat more grains because you know only a small quantity is needed to replant fields. Chinese were using metal multitubed seed drills as early as 200 B.C. Seed drills make an appearance in Europe in 1566 A.D., about 1,700 years after their appearance in China. As for how they were planting seeds before that … you had a guy with a bag of seeds planting them by hand, then another guy rakes over the earth to cover them. That method leaves a lot of seeds exposed to be eaten by birds or are planted too shallow to germinate. The crops that do germinate will be competing with other plants that are growing too close to them, and weeding the fields becomes very difficult, if not a waste of time. Out of the grains you wind up harvesting, a larger amount has to be partitioned for future planting, thus less are eaten. Compared to this hand-planting method, using a seed drill to plant crops in rows is 10 to 30 times more efficient in terms of how much grain you can harvest versus needing to save it for the next planting. Iron moldboard plow: Metal cuts better than wood? Imagine a plow. You’d probably think of something made out of metal (perhaps with a wedge), right? Well, plows weren’t always like that. The earliest plows in human history were basically a plank of wood that you knifed into the ground. Around 300 B.C., Chinese started using plows that were shaped in a way that they simultaneously cut into the earth and turned it, too. By 100 A.D., they were made entirely out of iron. Turning the earth is important for getting more nutrients out of your land and can even turn “barren” land fertile. Around 400 A.D., a similar moldboard plow appears in the Roman Empire, but widespread adoption is delayed with the fall of the empire. In 1700, Dutch traders brought Chinese iron moldboard plows back to Europe, and an agricultural revolution soon followed. Now, what was plowing like without an iron moldboard plow? That is a piece of wood being used to slice into the ground. Because that wooden plow doesn’t have a moldboard, the cut soil needs to be tilled through further labor. Iron was expensive and labor-intensive to produce, so at best you would have a thin sheet of iron covering the edge of your mostly wooden plow. So why did Chinese have all of these iron agricultural tools centuries earlier than Europeans? Because their methods of iron (and steel) production were also centuries ahead. The Iron Age is considered to have begun around 1700 to 1500 B.C. To extract iron from an ore of iron oxide, the iron has to be separated from oxygen and other impurities in a high-temperature process that takes carbon to extract the oxygen out of the ore as carbon dioxide. This is called smelting. The earliest smelting of iron ore was done at temperatures below the melting point of iron. This left a spongy mass of iron that needed to be shaped by hammering, a very work-intensive process. 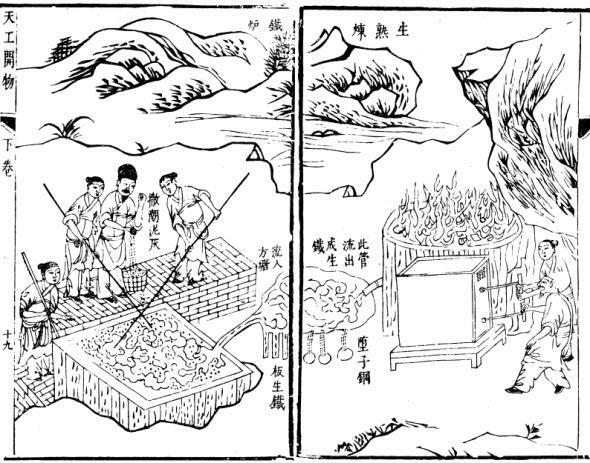 But some time around 600 B.C., Chinese developed a furnace that could create a heat intense enough to melt iron: the blast furnace. Once liquified, iron could be poured into casts already in the shape of tools that were needed. The iron-casting industry was officially supported by dynastic governments, leading to widespread adoption of iron tools made to a standard. Now, a special note about the difference between iron and steel. Cast iron is very high in carbon content, making it hard but brittle. Steel is iron that has a perfect balance of carbon to retain an edge but also maintain just enough flexibility to avoid brittleness. Around 200 B.C., Chinese learned that if air was blown over iron as it was being cast, the carbon content could be reduced, and what you wound up with was steel. Around 600 A.D., steel tools began to widely replace iron ones. The earliest evidence of blast furnaces in Europe is 1100, with widespread adoption occuring in 1400. The process of creating steel I described above first appears in the Western world in 1855, and there’s some contention that the “inventor” may have actually gotten the idea from Chinese workers in the U.S.
As another illustration of the difference in iron production, by 1078 the foundries of northern China could produce 114,000 tons of iron a year. In 1788, England produced about 50,000 tons of iron. Imagine a horse pulling a plow. 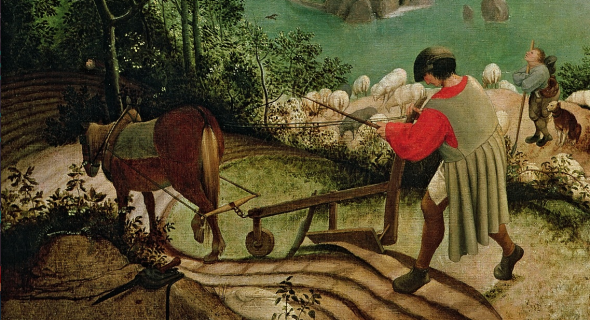 Now, how did you imagine that plow being attached to the horse? With a horse collar, right? Unfortunately for horses, before the collar was invented, there was the throat-girth harness, which sounds as awful as it is. A plow (or any other load) attached by a throat-girth harness means that a horse is basically pulling with a noose around its trachea. Around 300 B.C., someone in China thought, What if the horse pulled with its chest instead of its throat? So the breast-strap harness was born, and horses across China breathed a sigh of relief. This was improved on in 500 A.D. with the horse collar as we know it. The breast-strap harness appears in Russia in 700 A.D., and shows up further west in Norway around 800 A.D., with widespread adoption by 1200. The difference between China and Europe’s population levels throughout history is the difference between their agricultural technology. China had time-saving, force-multiplying tools (that didn’t strangle horses) for centuries, even millenia, before adoption in Europe. What is it like to be an ABC (aka American Born Chinese) living in China? What are some of the most mind-blowing facts about China? What does the Internet look like in China?